Earlier this week I had a number of meetings in London and for the last of them I was looking for a central café. I am not sure that’s quite how John Lewis on Oxford Street really likes to think of itself, but it fitted the purpose. The real reason for choosing it was that the person I was meeting asked if I’d seen the John Lewis 150 exhibition ‘Stories of a Shopkeeper’. Obviously most people are aware of the 150th anniversary but the exhibition may be less well known. And no, I had not seen it. JLP are really lucky (though luck probably didn’t come in to it) in having such a rich preserved heritage which can be used in this way – from the original takings book onwards. They have a treasure trove and have used a small part of it here. When the Oxford Street store was bombed in 1940 and had to shut down, JLP sent a letter to every known store customer about the problems and their way forward. Nicely composed, individualised and then typed up, they must have taken the typing pool weeks to cover the entire customer base! Today we press a button, enshrining spelling mistakes and all to the history books. The bomb impact on the Oxford Street store in fact lasted until the new store opened in 1960. We perhaps forget how bad parts of our country were through the 1950s – “you’ve never had it so good” masked a lot of damage and unfinished renewal. I’d always assumed the Hepworth sculpture (Winged Figure) on the building was a later addition but actually it is pretty contemporaneous, which says something about the building I think. As you leave the exhibition, an old man is shown speaking on a TV screen in colour. John Spedan Lewis in his own words, recorded just before he died. A fitting end to an interesting exhibition. These points were especially pertinent to us, as my coffee guest was Neil Tyler, whose book on Sanders Brothers is due out in July. Sanders Bros is a forgotten food retailer (more stores than Tesco or Sainsbury in 1939) which Neil has sought to resurrect, despite the lack of an archive or any of the richness that JLP possess. A tough job, but a remarkable story. I’ll say more on Sanders when the book is published. 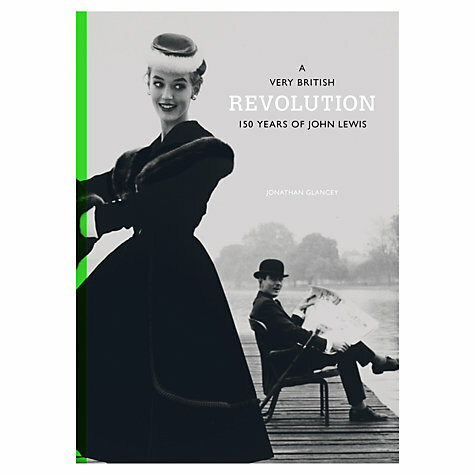 There is also a book associated with the JLP exhibition – A Very British Revolution:150 years of John Lewis by Jonathan Glancey. I’ve not had chance to read it yet, but bought a copy online from John Lewis (it is available at the exhibition but I had enough to carry!) and had it sent free for Click and Collect at the Waitrose store in Stirling. A very modern retail shopping experience, which worked well. If you’re in London the Stories of a Shopkeeper exhibition now runs to the end of August. Or you could just go for a coffee! I am Professor of Retail Studies at the Institute for Retail Studies, University of Stirling, where I research and teach aspects of retailing and retail supply chains, alongside various colleagues. I am Chair of Scotland's Towns Partnership. I am also a Deputy Principal of the University, with responsibility for Internationalisation and Graduate Studies. This entry was posted in Books, Click and Collect, Department Stores, Heritage, Historic Shops, John Lewis Partnership, London, Retail History, Sanders Bros, Waitrose and tagged Design, Exhibition, John Lewis Partnership, Oxford Street, Sanders Bros, Stories of a Shopkeeper. Bookmark the permalink.